I've noticed guitars much more as I listen to music these days. I'm not a musician or in any way musically gifted. But I'm so curious as to why all the polls I've seen place Jimi Hendrix at the top for best lead guitarist. I really want to understand why he is rated higher than say Jimmy Page? I'm 49 years old and Jimi Hendrix was a little before my time, so maybe you just have to hear his playing? Let's agree that he should remain in the number one spot. I have a follow-up question. PS This is my first Topic Post. If I've not done something right (sorry) would the moderator please delete..thanks! Its because he was an innovator, you have to imagine before him it was Hank marvin twanging or some jazzers but by the mid late 60's jazz was in a bad place. 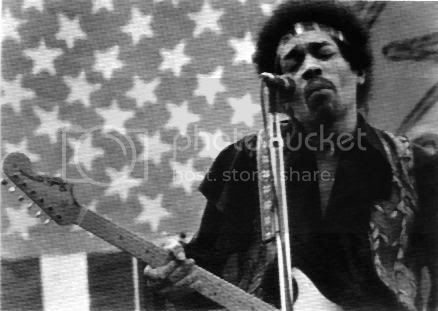 Hendrix came along and made everyone realise the possibility of the electric guitar with whammy bar techniques, feedback, his soloing and rhythm playing was beyond anything before. Its easier to come along after and better what he did but to be an innovator in music is just the coolest. That's why he is voted number one alot because he influenced just about everybody playing electric guitar. Eddie Van Halen ten years later was also prob the most influential guitarist after Hendrix as he again innovated more whammy bar stuff and he popularised a technique called tapping on the guitar, again people came along after and bettered it but again they were not innovators. Howe is a great guitarist, he can play any style and thats very cool, but he wasn't an innovator, he plays the guitar in a conventional way ( thats not bad), but hendrix and halen were not conventional thus making them to inovate. Pagey is also an unconventional player but his innovation was in the studio with producing and recording techniques, he was more than just a guitarist. Agreed, so many people have taken Jimi's style on board that it sounds conventional today, but at the time he started the Experience - although he was obviously influenced by a lot of other musicians (Buddy Guy for example) - nobody sounded like Hendrix. Hi Lee how are you ?? I have been back on the board for about 3 weeks after a layoff. Well, I never realized Jimi was the first to do so much with the guitar. But, there were still a lot of other good guitarists out there playing before Jimi went to England. I'm thinking of Page/Clapton/Beck/Townsend/K. Richards. What you're saying (I think) is despite these early players skill/creativity, Jimi Hendrix still rose above what was going on at that time to innovate a whole lot of new stuff. That makes sense. I never realized that and was always curious because I've NEVER seen a poll he is not #1 on lead guitarists. You have me curious about Eddie Van Halen. I'm going to have to head over to you tube and check his playing out. His band was not one I ever listened to, but of course I have heard of him and do remember "Jump"---his song right? If there is one epic Eddie Van Halen piece I should sample his playing style would you please post back what it is? Bizarre as you post wasn't here when i did mine ....Great stuff, whether anyone likes his music or not he is almost as important han hendrix and in someways is. ( for Missy)Should also like to mention Frank Gambale an Australian fusion guitarist who invented a technique on the guitar known as sweep picking, we take it as normal like tapping (Eddie) and everything else we do but in the 70's he invented this now standard technique. Not really as unconventional as Hendrix or Halen But Gambale was a pioneer for this. The late 60's and 70's was a very important time with Hendrix showing us what to do, halen and tapping with Gambale and sweeps. There's no doubt that EVH was / is important. I admit that I get a little tired of the dive bombs and tapping as such ( I prefer his riffs, fills and tone ) ) but, he definately set a standard . It could be said that many have successfully matched or surpassed his technique but IMHO ,very much like Jimmy Page, they have not matched the heart and soul that's within his playing. Frank Gambale...what a player ! I know what you mean getting tired of the stuff, but I think if you take a little of each othe players we have mentioned in thiswhole thread, then your on your way to becoming that all round musician. Now back to trying to inovate....how about tapping with my feet, nah look silly. Maybe we should start a thread, what things other than pick,fingers have people played guitar with. Just wanted to mention a guitar hero of mine, in Ritchie Blackmore, although he never invented anything etc he did open the doorway to Neo Classical guitar, listen to alot of his solo's and lots are classical inspired, Child in Time solo was ahead of its time. A showman and a pioneer in the neo classical movement. In a time where rock players weere playing the Pentatonic and blues scale, he came along and started using harmonic minors, melodic minors,Phyrgian Dominant modlal scales way before others in this field. (classical guys were obviously using them) but not rock. Here's the only Eddie Van Halen solo I found so far that I liked somewhat. Now check out this solo and tell me if Eddie didn't get some innovation from one Jimmy Page. Feel free to tell me I don't know what I'm talking about (and maybe I don't) because like I said, I'm not a musician. But, I genuinely like learning these things about the guitar. To keep this on topic, I'm guessing that even if Eddie Van Halen was an innovator, he would still likely rank Jimi Hendrix #1 as lead guitarists go, agreed? So your right missy, Page is a master at mood soloing, Since I been Loving You is a good example of melodic phrasing, using different tones from the guitar and also the pressure he uses with his fingers and pick. PS your Halen clip is a version of Eruption. Yeah missy, No doubt EVH would rank Hendrix but from what I remember , I think he was a Clapton guy. I know this is not the spot for it, but I'm having trouble trying to send a PM. I get the "an error has occured "Array" message. During the Cream years but I'm just going by past interviews that I've read. Something to the effect that it was Clapton more than Hendrix, Page and Beck . Gee didn't know that, I rate those 3 above Clapton, but each to their own. After listening to several Jimi Hendrix videos, This is the one I decided is the best representation of his greatness. And yes, I see now why he is ranked #1. I based this on a criteria of style, substance, and that elusive guitar trait l call "warmth". **His vocals are pretty fine here too. Hendrix had it all and for my money, the best and most influencial guitar player ever. Thing is, he played in an era that spawned so many great ones so to me his influence is best described as a player who motivated people to pick up a guitar and give it a go as opposed to copying his style. EVH on the other hand had every up and coming guitar player trying to copy and sound just like him and for the better part of 20 yrs, most of them did sound just like him. I consider him a great rock player and there is no question that he pioneered a sound and technique but I tire of him easily. Hendrix on the other hand,I never tire of. He could play anything and make it sound good.